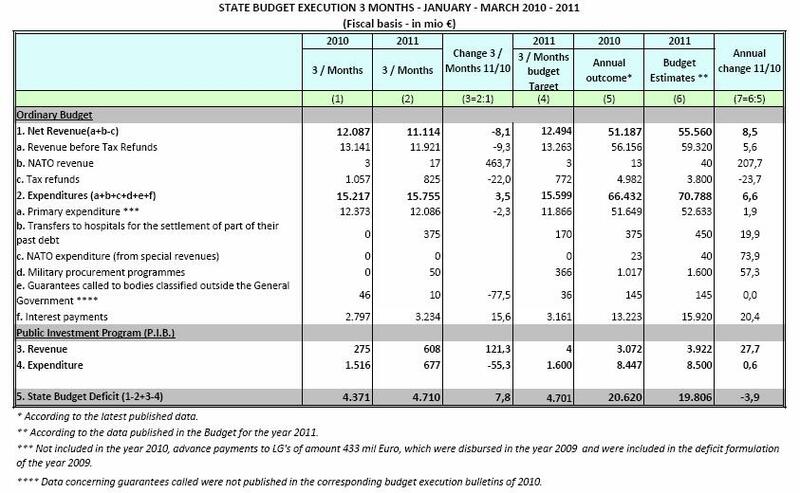 Revenues continue to lag forecasts and the fiscal position is deteriorating: -9.8% during Jan-Feb 2011, -11.0% during Q1 2011. Expenditures seem to have reached a point where it is very difficult to significantly cut further. 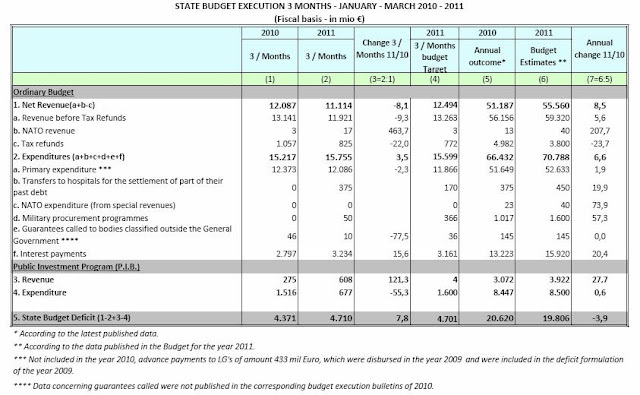 The PIB item was actively “managed” in February (see my previous comment on 29th March) but this could not be repeated. GDP is expected to contract for the third year in a row and there is no way that unemployment will not also deteriorate to ~15%. Debt as a % of GDP will continue to increase at least until 2014 according to my calculations. 5 yr CDS spreads are at record levels at 1221 b.p. on Friday according to CMA, the world riskiest sovereign by a long margin, i.e. a 63% of default risk. Markrit has 1090 b.p. CDS insurance cost, a 117 b.p. increase over the week and +51 b.p. Friday alone. Spreads with Germany’s 10 yr bond yield have also passed the 10% mark! Bondholder will take a haircut, which is perfectly normal since investors should pay for their mistakes, not the taxpayer. This is the only way to finally clean banks’ balance sheets and let go under the ones that are undercapitalized. The EUR has been unscratched since early January due to major events in other parts of the world, but I do not believe this is going to last for very long, at least the CDS markets believes so. The more so if the FED takes a less dovish stance at its next meeting April 26-27, which I expect. 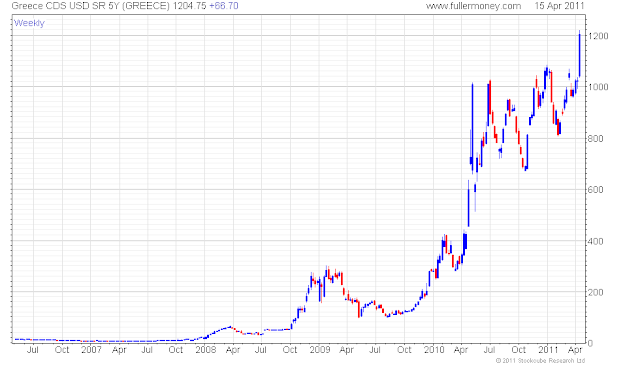 Markets & Beyond: Portugal, Greece and the EURO crisis- What the news are? The French mint issues a limited series of gold and silver coins: a rip-off! The French mint (“Monnaie de Paris”) is issuing 10,000 gold EUR 1,000 face value (weight 20 g or 0.71 oz @ 999.99/1000 title) and 50,000 silver EUR 100 face value (weight 50 g or 1.76 oz @ 900/1000 title). They will be delivered from mid-June to end July and a 30% deposit is required to reserve them. First, Gold coins were already sold out within 48 hours with people queuing in the street at “ Monnaie de Paris” Thursday and Friday. Tuesday, I was told by officials there that silver coins were also sold out. Second, it is a rip off!! 2) The interesting feature is that the coins have legal tender and it is therefore possible to exchange them at face value at any bank in France (and probably throughout the eurozone but I could not find confirmation of this). This means that if the metal value of coins was to fall below the face value of coins, investors would still get the face value. This puts a floor on gold and silver prices: it is the same as having a free undated long put on gold and silver prices. If gold prices continue to go up, then the value of coin will go up accordingly. If gold prices were to fall to EUR 500/oz giving a gold value for gold coins of EUR 323, your coin would still be worth EUR 1,000. There is more than one catch however: as usual no free lunch! 1) According to the data indicated on “Monnaie de Paris” web site, the oz used is an ounce and not a troy ounce; this means 28.35 g/oz is used instead of the 31.104 g/oz for the quotation of precious metals, a ratio of 0.912 (see calculation below). Gold @ $1,460/oz x 0.912 x 1.44 EUR/USD x 0,71 oz= EUR 656.51, over 50% premium! Silver @ $40.6/oz x 0.912 x 1.44 EUR/USD x 1.76 oz = EUR 45.26, over 120% premium!!! I doubt the collectable value (if any) warrants such premia. As usual the poor guy in the street has been ripped off. And paying a put option at such premia looks very rich to me. 3) If the price of precious metals were collapsing, I also doubt that French authorities would not renege on the possibility to exchange the coins at their face value. One last thing, the price includes 19.6% VAT; if you are a non-EU resident you are normally entitled to the reimbursement of VAT (and you pay whatever tax, if any, in your country of residence); here, forget it: you pay the full price. Why on earth any rational investor would buy these coins when much cheaper alternatives are available; the history of love French have with gold is so long that they were trapped once again by the Ministry of Finance... (this does not mean that there will not be a mini-bubble in the short term – Oops! A bubble created by a Ministry of Finance, anything new? ).